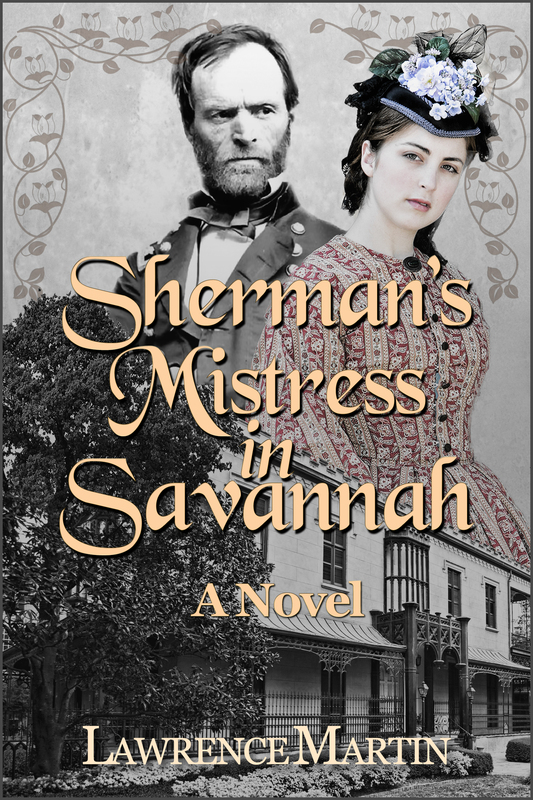 Three novels on the Civil War by Lawrence Martin: Sherman's Mistress in Savannah; Out of Time - An alternative outcome to the Civil War; and Liberty Street: A novel of late Civil War Savannah. Click on cover for Amazon link. 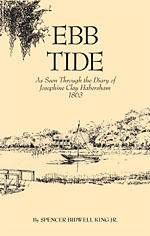 Civil War Savannah is a straightforward, annotated history, highly recommended as an introduction to Civil War Savannah. This book and Jacqueline Jones' Saving Savannah (below) complement each other. Saving Savannah is a detailed narrative, with emphasis on the role of Savannah's slaves and free blacks during and after the war. This is a scholarly work by a distinguished professor at the University of Texas, with many references. Jacqueline Jones de-emphasizes battles (barely mentioning Fort McAllister, and omitting Pulaski's victor Quincy Gillmore altogether), and instead emphasizes the society of Savannah before during and after the war. Click here for a brief interview with the author. 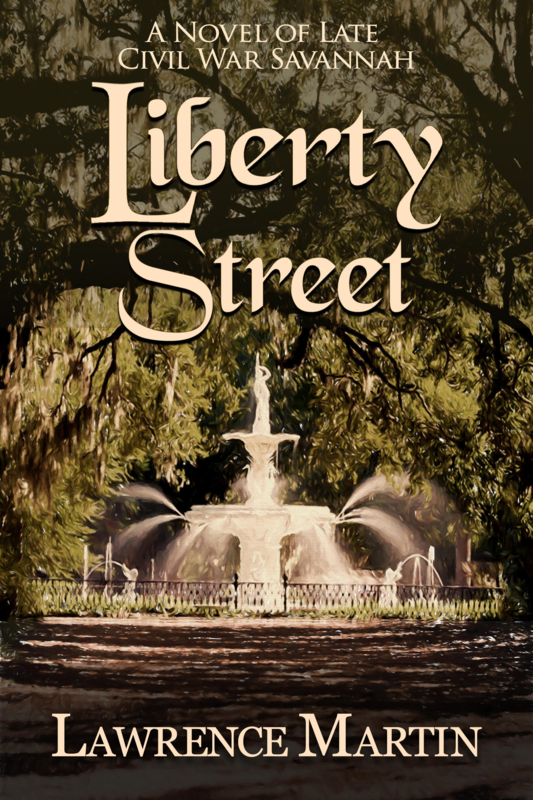 Saving Savannah and Civil War Savannah complement each other. Civil War Savannah is an epic 4-volume history of Savannah in the Civil War. Information about the book project and the authors can be found at the book's web site. The first volume, "Savannah, Immortal City" (cover above), contains many maps and photos of the era. Click here for video presentation about the book. 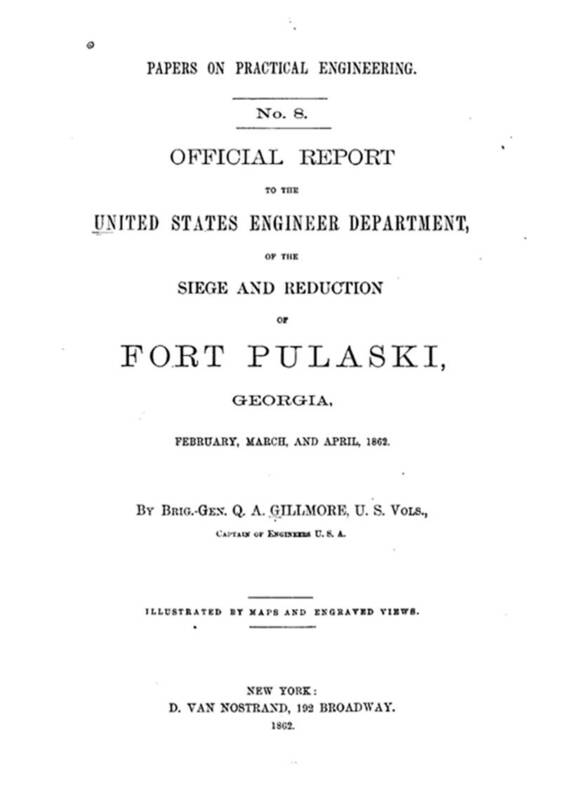 Official Report to the United States Engineer Department of the Siege and Reduction of Fort Pulaski Georgia February March and April 1862 is by Brig-General Quincy Adams Gillmore, who commanded the bombardment of Ft. Pulaski on April 10-11, 1862. It is his official account of the battle, full of wonderful detail, including a chronology leading up to the battle, information about each of the gun batteries used to "reduce" the fort, and several photos. Gillmore's full account (cover page above) is also available on-line at Google Books. Vital Rails is about the rail line between Savannah and Charleston that was completed in 1860. It became integral to the Confederacy's battle against the naval blockade and held until Sherman's occupation of Savannah in December 1864. It was so vital during the war (hence the title) that Robert E. Lee placed his low country command headquarters (November 1861 to March 1862) in one of the towns along the route, Coosawhatchie. Altogether there were eight battles and skirmishes with Union forces along the line -- including the Battles of Pocotaligo in May and October of 1862 and the Battle of Honey Hill in November 1864. The "low country" refers to the coastal regions of Georgia and South Carolina, including the principal cities of Savannah and Charleston. 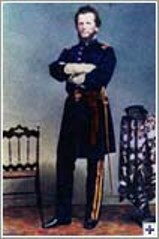 Though Lee is most often associated with famous battles (Chancellorsville in Virginia, Gettysburg in Pennsylvania, Antietam in Maryland), early in the war he spent quite a bit of time in the low country. His first sojourn was as a young West Point graduate, 1929 -1931, helping to build Fort Pulaski. 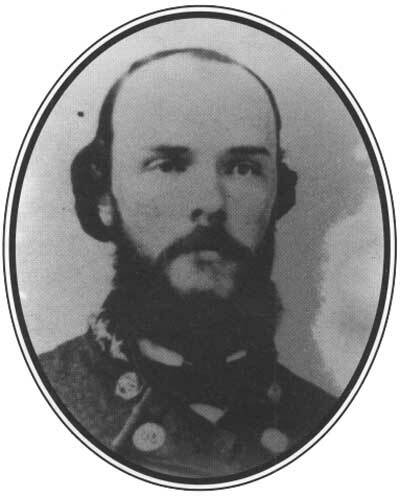 He then returned 30 years later as a Confederate General, and commanded defenses from November 1861 - March 1862. Initially his headquarters was at Coosawhatchie near Beaufort, SC, then in Feb 1862 he moved to Savannah. In March 1862 he was recalled by president Jefferson Davis to Richmond. Lee in the Low Country concentrates on Lee during 1861-1862. Sumter is Avenged!, published in 1995, is now out of print but was found on eBay. 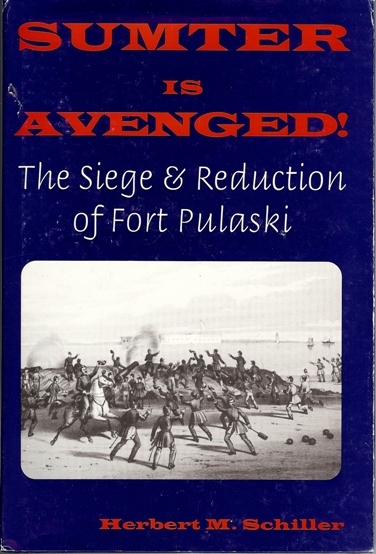 It's a well-annotated account of the siege and reduction of Ft. Pulaski, by physician and civil war historian Dr. Herbert M. Schiller. Includes many period maps and photos. This book and Brig-General Quincy Gillmore's own account are core documents for studying the fall of Fort Pulaski. It was used as a "testing ground where the Confederates refined concepts of coastal- fortification design, and the Federals evaluated new warships and ordnance under combat conditions. It was the final obstacle to Gen. William T. Sherman's March to the Sea and proved to be the key to his capture of Savannah. The physical survival of the fort in modern times is due to Henry Ford's initial renovation in the mid 1930s. 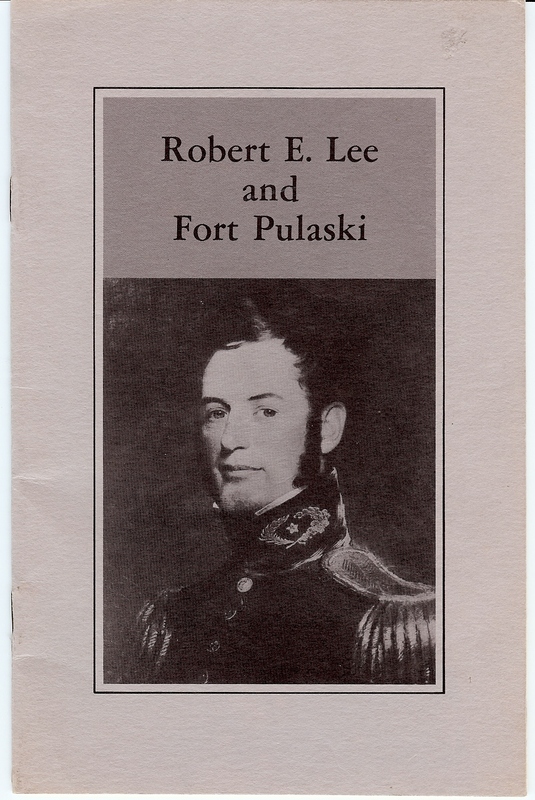 Robert E. Lee and Fort Pulaski, a 27-page pamphlet, was published in the early 1940s by National Park Service Historian Robert W. Young. Shown above is the cover as republished in 1970 (found on eBay). Text and most of the photos from this pamphlet are reproduced in the nps.gov web site on Robert E. Lee and Fort Pulaski. 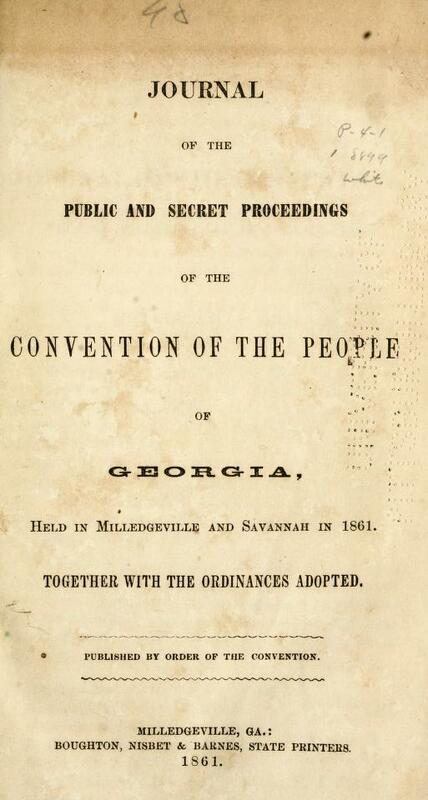 The complete minutes of the Georgia Secession Convention, including both "public" and "secret" meetings. 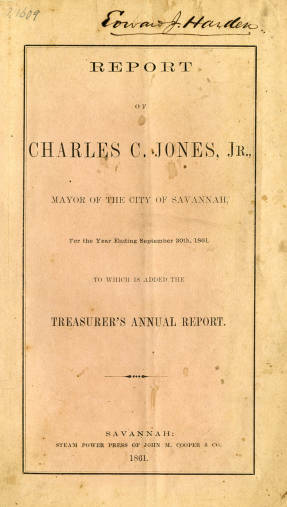 Savannah Mayor Charles C. Jones' Annual Report, 1861. In addition to the Treasurer's Report of the city's finances, it contains Mayor Jones' comments justifying the rebellion and calling on citizens to keep firearms handy for use "at a moment's notice." Fanny Yates Cohen Diary, December-January 1864. This brief diary -- only 4 sheets of paper, front and back -- was kept by a young Savannah woman during Sherman's occupation of the city. The entire diary is included in the above 1957 article published by the Georgia Historical Society. Only the first page of the aricle is on-line, but the entire article is available from numerous lending libraries (listed on the web site). Platter Diary, Nov 10, 1864 to April 27, 1865. 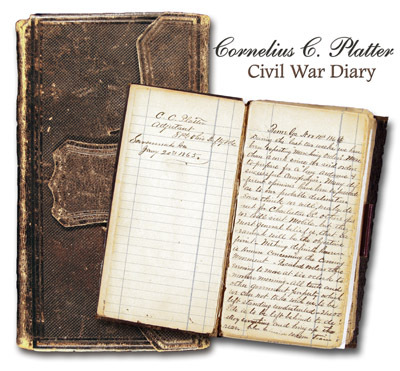 This diary, meticulously kept in neat script by Lt. Cornelius C. Platter, covers his march through Georgia and the Carolinas with General Sherman's army. The diary has been transcribed, indexed and placed on-line by the University of Georgia Libraries. Savannah Civil War Videos, a series of short educational videos covering Ft. McAllister, Civil War railroads, Prison Camps, Fort Walker, Fort Jackson and other topics. Savannah Harbor during Civil War. The narrator, Barry Sheehy, is author of Immortal Savannah (see above). Forsythe Park Confederate Memorial. Another Sheehy narration about Civil War Savannah. Look for several other Youtube videos Sheehy narrates about Civil War Savannah. Sherman's March, part 3 of 5. Part 3 of this series starts with capture of Fort McAllister and includes the occupation of Savannah. Note the narrator mistakenly gives the date Sherman sent his famous telegram as December 24, 1864; it was actually sent Dec 22. 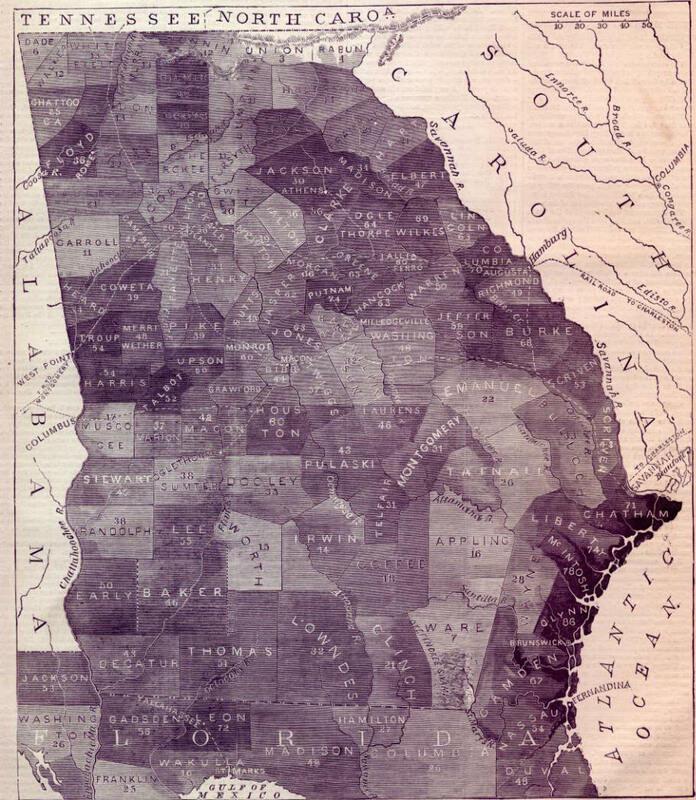 Since South Carolina voted to secede on December 20, 1860, Georgia leaders and politicians have strongly considered secession. They realize that Fort Pulaski -- at the mouth of the Savannah River -- could soon be occupied by Union forces against them. On this date George Governor Joseph E. Brown arrives in Savannah from Milledgeville, the state capital, to determine a plan of action. Governor Brown issues an order for the Georgia militia, under General Alexander Lawton, to "take possession of Fort Pulaski" and to "hold it against all persons, to be abandoned only under orders from me or under compulsion by an overpowering hostile force." 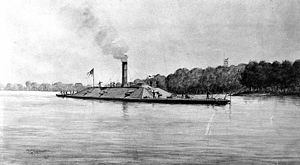 The steam ship Ida sails from Savannah with 150 troops, and lands on Cockspur island, site of Fort Pulaski, 15 miles downriver from Savannah. Confederates seize the fort without firing a shot. (Only a caretaker and one ordinance officer are in the fort.) While the fort itself is in good shape the grounds are overgrown with vegetation, the guns are in disrepair and the moat is filled with silt. Over the next several months the Confederates - with the aid of slaves - proceed to rehabilitate the fort. 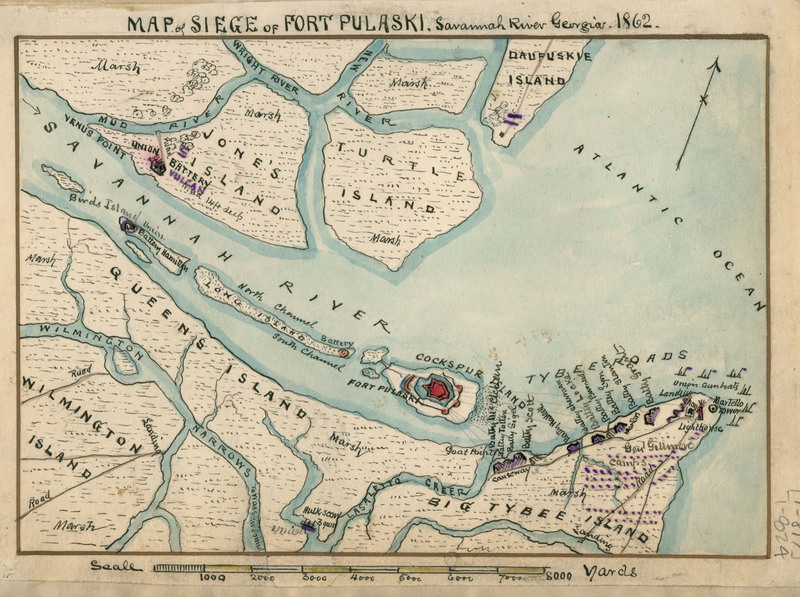 Left: Civil War map showing location of Ft. Pulaski at mouth of Savannah River. (Click here for larger image of map.) Right: Modern-day view of Ft. Pulaski, showing southeast wall with cannon damage from April 1862 bombardment. Savannah River is at top of photo. 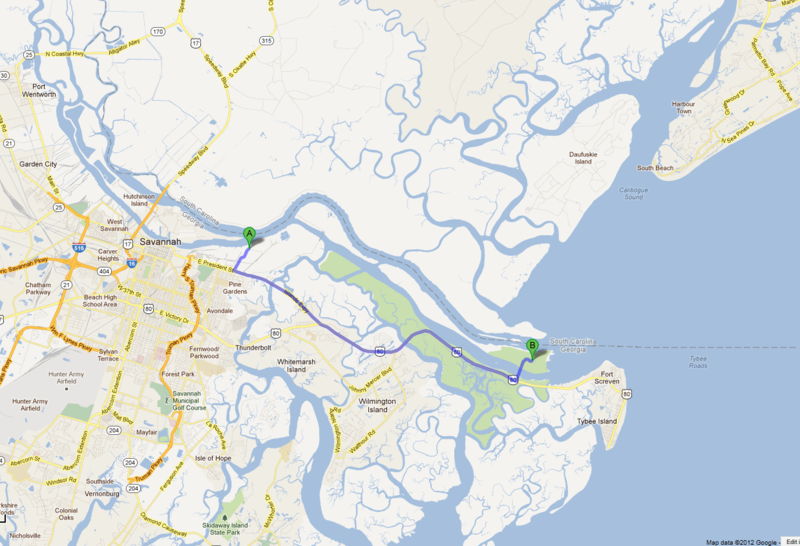 Left: Location of Ft. Jackson (A) in relation to Ft. Pulaski (B) in modern day map of Savannah area (click on map for larger image). Right: One of Ft. Jackson's guns overlooking Savannah River. Georgia state convention convenes in Milledgeville to decide on secession. On January 19 a majority of Georgia delegates vote to secede from the United States. The vote is 208-89 to adopt an Ordinance of Secession. We the people of the State of Georgia in Convention assembled do declare and ordain and it is hereby declared and ordained that the ordinance adopted by the State of Georgia in convention on the 2nd day of Jany. in the year of our Lord seventeen hundred and eighty-eight, whereby the constitution of the United States of America was assented to, ratified and adopted, and also all acts and parts of acts of the general assembly of this State, ratifying and adopting amendments to said constitution, are hereby repealed, rescinded and abrogated. We do further declare and ordain that the union now existing between the State of Georgia and other States under the name of the United States of America is hereby dissolved, and that the State of Georgia is in full possession and exercise of all those rights of sovereignty which belong and appertain to a free and independent State. Georgia's Secession Convention reassembles in Savannah. On March 16 the convention ratifies the new Confederate Constitution and begins work on a a revised Georgia state constitution. On March 21 Alexander Stephens, provisional Confederate Vice-President, delivers his Cornerstone Speech in which he lays out a defense of slavery. ...[Slavery] was an evil [the Founding Fathers] knew not well how to deal with; but the general opinion of the men of that day was, that, somehow or other, in the order of Providence, the institution would be evanescent and pass away... Those ideas, however, were fundamentally wrong. They rested upon the assumption of the equality of races. This was an error. It was a sandy foundation, and the idea of a Government built upon it -- when the "storm came and the wind blew, it fell." On March 23 the Secession Convention adopts a proposed new state constitution for Georgia, which will be submitted to voters in July. Following this last action, the Convention adjourns. Confederates under General P.G.T. Beauregard bombard Ft. Sumter in Charleston Harbor, another of the "3rd Defense Forts" like Ft. Pulaski. Union forces in Ft. Sumter under Major Robert Anderson surrender the next day. The Civil War has begun. Robert E. Lee resigns his commission from the United States army and joins the Confederate army, stating his allegiance is to Virginia. 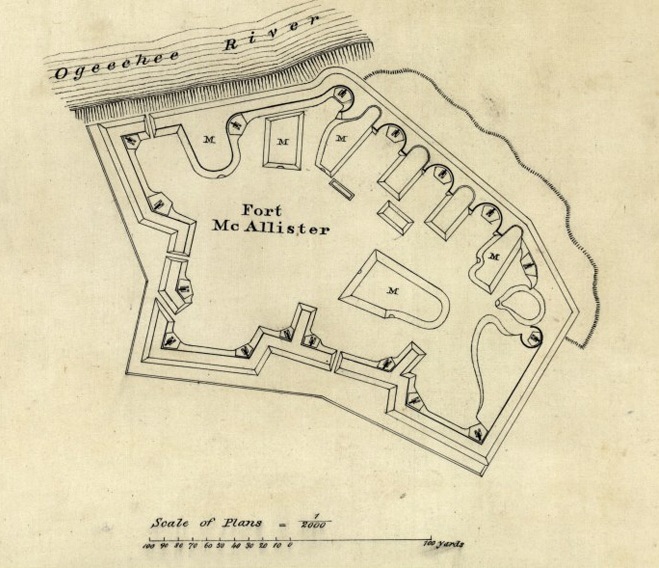 Early drawing of Ft. McAllister on the Ogeechee River, and present day Google map showing location of Fort McAllister. Fort McAllister is now a state historic park. The first exchange of hostile gunfire on the Georgia coast takes place. Men of the Republican Blues, a Georgia militia unit established in 1808, engage a blockading vessle near the north end of Wassaw Island. "The brief exchange of cannon fire served no real purpose, but it was the first test of combat for the Republican Blues." (Guardian of Savannah: Fort McAllister, page 7). Robert E. Lee, now a general in the Confederate army, is appointed commander, "Department of South Carolina, Georgia and Florida." He is charged with improving the defenses of the southeast coast. Union forces capture 2 Confederate forts -- Fort Walker and Fort Beauregard -- that guard the entrance to Port Royal Sound. Port Royal is strategically located just 10 miles north of Tybee Island and Ft. Pulaski. 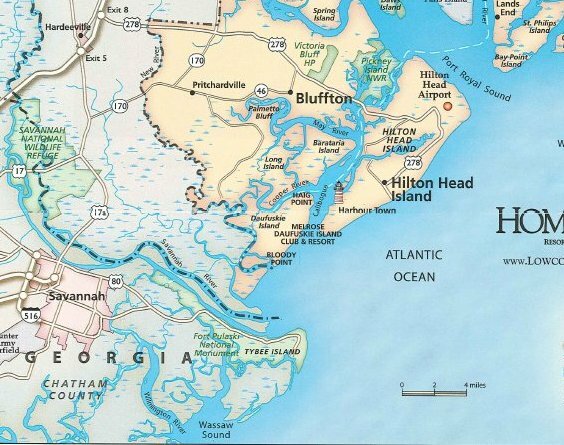 See current-day map; Port Royal Sound is just north of Hilton Head Island. 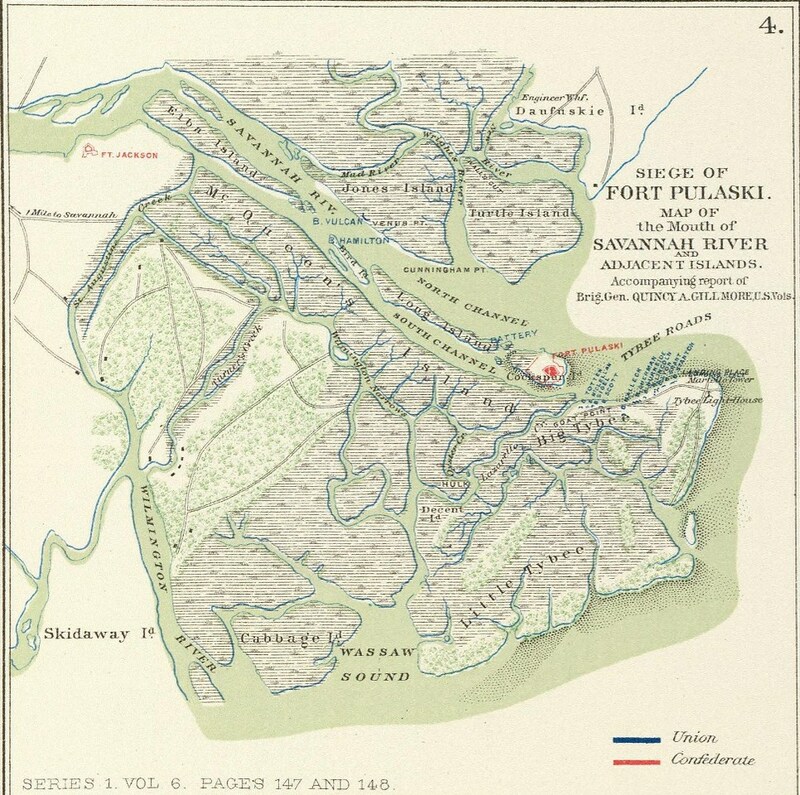 Fort Pulaski (not labeled on this map) is situated immediately north and west of Tybee Island (see map under January 3, 1861). After the battle Port Royal Sound becomes a base of Union operations to further enhance the naval blockade of Charleston and Savannah. The next major Union objective is the siege and reduction of Fort Pulaski. 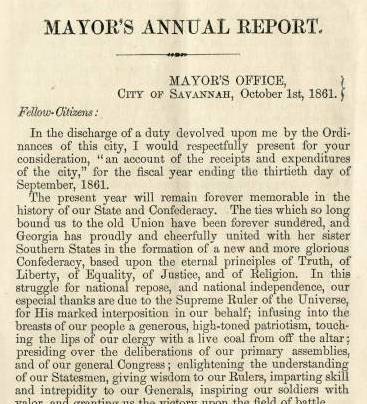 Robert E. Lee arrives in Savannah and the next day comes to Ft. Pulaski. There he is welcomed by its commander, Major Charles H. Olmstead (left). Lee (right) gives instructions on defensive work in the fort. During this visit Lee points to nearby Tybee Island and, as famously quoted by Olmstead, says: "...they will make it very warm for you with shells from that point but they cannot breach at that distance." Union forces, having learned that all confederate guns on Tybee have been removed, set ashore on Tybee Island. Under the command of Quincy Gillmore, they begin building batteries of guns on the north end of the island. 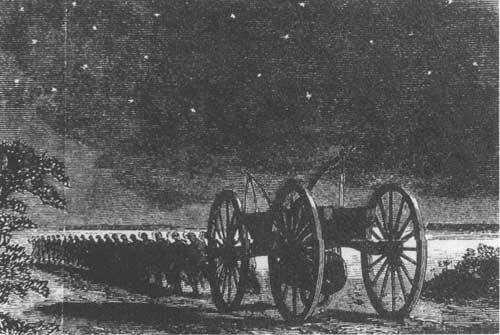 These guns are hauled across Big Tybee Island at night, to avoid detection (drawing from Harper's Pictorial History of the War of 1861). 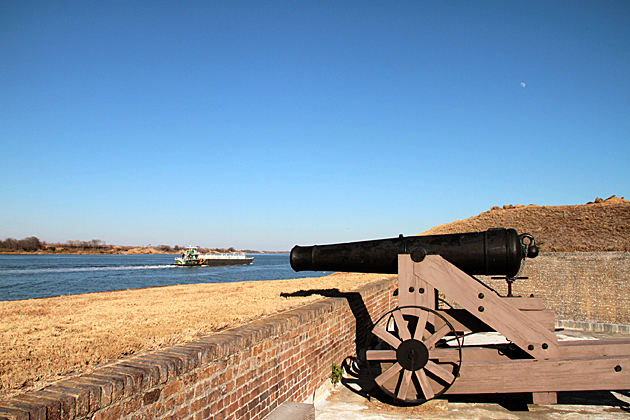 The stretch of island where the guns are arranged is from about 1 mile (Battery Totten) to about 2 miles (Battery Stanton) from Fort Pulaski, across the southern branch of the Savannah River (see April 8, 1862). In addition to preparing for assault on Fort Pulaski, the guns help seal the mouth of the Savannah River from blockade runners (at the same time helping prevent ships already in port from leaving, like the Fingal (later remade into the CSS-Atlanta). WE publish...a CHART MAP OF GEORGIA, similar to the one we published of South Carolina in our Number of November 23. The tint, by its depth of shade, shows the comparative percentage of slaves to the total population in each county, that percentage being likewise stated in figures in the centre of the tint. Thus in Ware County only seven per cent of the total population are slaves, while in Chatham County the percentage is 71, or nearly three-quarters. It will be noticed that the largest slave communities are on the seashore and round the points to be occupied by our troops. 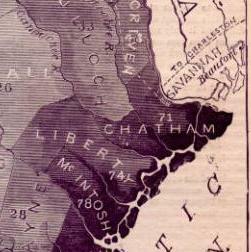 Chatham County, in which Tybee is situated, contains 71 per cent. of slaves ; Glynn County, where Brunswick is situated, 86 per cent. ; Camden County, whose sea-port is Fernandina, Florida, 67 per cent. This map will be of use to the philosopher and student. 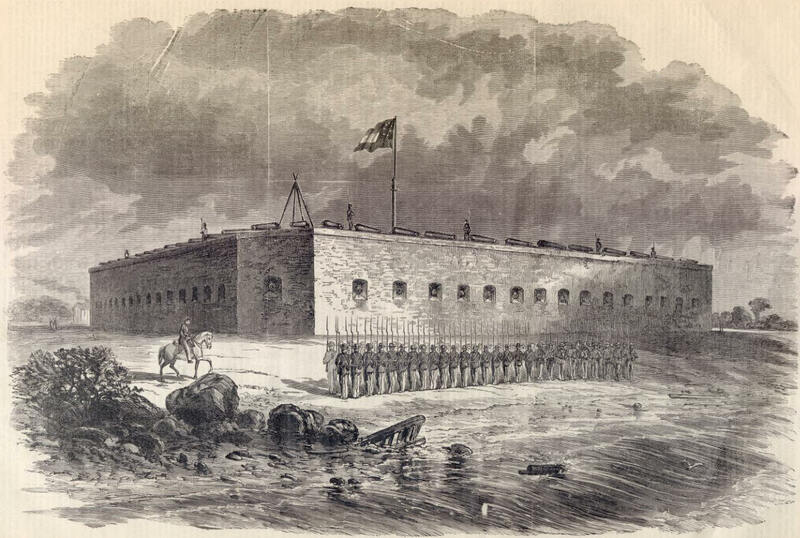 Fort Pulaski as it looked April 1862, immediately after the bombardment. Note the destruction in the southeastern corner. The anniversary of the attack on Fort Sumter could not have been more fitly celebrated than it was by the capture of Fort Pulaski, by its rightful owners, from the rebels, who for sixteen months have usurped its possession. Twelve months to a day from the time the now discomfited BEAUREGARD summoned Major ANDERSON to surrender Sumter, the beleaguered garrison in Pulaski capitulated to the National force. Whether Gen. HUNTER had an eye for a bit of poetic justice in thus timing the attack, we know not, but the gratifying achievement is made doubly gratifying by presenting a conspicuous instance of historical retribution. 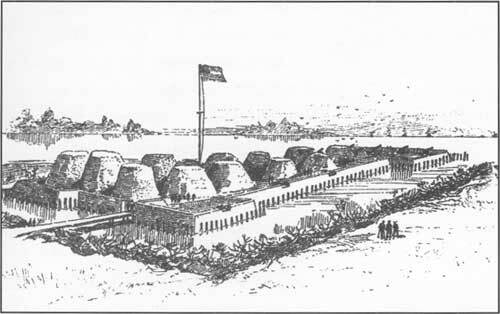 The first of the Pulaski prisoners begin arriving to Governor's Island, New York. They will move several times before the war ends. SIR: I have the honor to report that several batteries established on Tybee Island, to operate against Fort Pulaski, opened fire on the morning of the 10th instant, at 8 o'clock, commencing with the 13-inch mortars. When the range of these pieces had been approximately obtained, by the use of signals, the other batteries opened in the order previously prescribed in "General Orders, No. 17," from these headquarters, hereunto appended, as part of this report, so that by 9 1/2 o'clock all our batteries -- eleven in number -- had commenced their work. The breaching batteries opened at 9 1/2 o'clock. With the exception of four 10-inch columbiads, dismounted at the outset by their own recoil, in consequence of their having been supplied pintles, and from very serious defects in the wrought-iron chapis, which will be noticed more fully in my detailed report, all the pieces were served through the day. 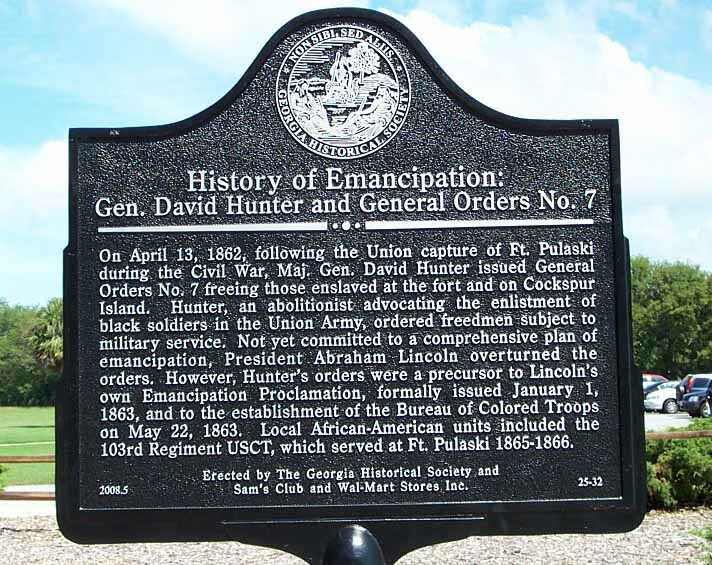 Maj. Gen. David Hunter issues General Order No. 11, freeing slaves in Georgia, Florida and South Carolina. General Order No. 11 - HDQRS Dept. of the South, Hilton Head, Port Royal, S.C. The three States of Georgia, Florida and South Carolina, comprising the military department of the south, having deliberately declared themselves no longer under the protection of the United States of America, and having taken up arms against the said United States, it becomes a military necessity to declare them under martial law. This was accordingly done on the 25th day of April, 1862. Slavery and martial law in a free country are altogether incompatible; the persons in these three States — Georgia, Florida, and South Carolina— heretofore held as slaves, are therefore declared forever free. The result of the efforts to breach a fort of such strength and at such a distance confers high honor on the engineering skill and self-reliant capacity of General Gilmore. Failure in an attempt made in opposition to the opinion of the ablest engineers in the army would have destroyed him. Success, which in this case is wholly attributable to his talent, energy, and independence, deserves a corresponding reward. CSS Georgia is launched on the Savannah River, but is not battle ready. July 1 -- Fort McAllister comes under Union bombardment in the first of seven gunboat attacks in 1862-1863. On this date the gunboat USS Potomska approaches the fort on the Ogeechee River, looking for a blockade runner. Shots are exchanged between the gunboat and fort, but no damage is done. The Potamska's commander, Lt. Cmdr. Pendleton G. Watmough, files a report which is the U.S. Navy's first official notice of the existence of Fort McAllister. Fort McAllister as it appeared in the Civil War. The Ogeechee River is behind the fort. The U.S. navy ships are the Paul Jones, the Unadilla, the Huron and Madgie. Shots are exchanged for about an hour, and the boats then retreat, without touching or seriously damaging Fort McAllister. 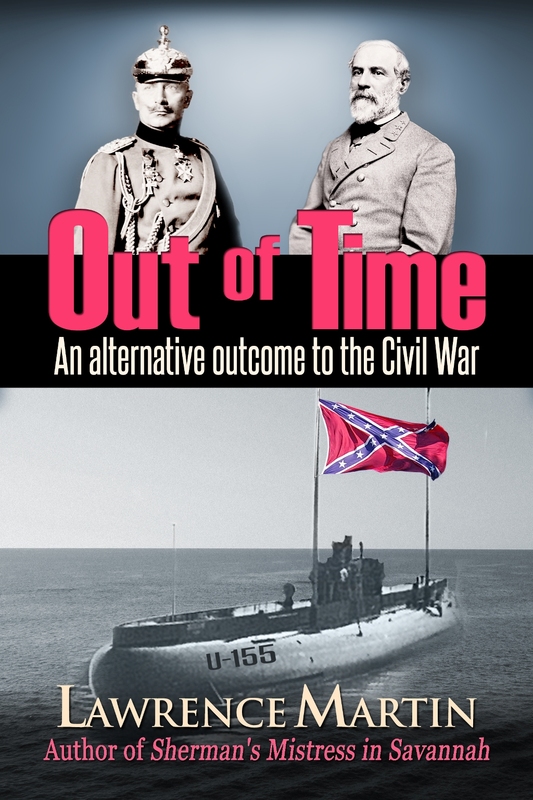 However, after this skirmish the gunboats Potomska and Unadilla alternate blockading duty at the mouth of the Ogeechee River, to assure Wragg does not escape. July 31 -- First trial run of ironclad CSS Atlanta, also on Savannah River (shown below). This ship was originally the Scottish steamer Fingal remade into an ironclad when the Union blockade prevented it from returning to England to pick up much needed supplies. She proves to be leaky and "slow to respond to her helm." October -- Construction of CSS Georgia is completed; she is covered with armor plating 4 inches thick and is 250 feet long (photo below). She suffers from "lack of propulsion" and has to be towed into place, in effect becoming a "floating battery." November 2 -- A third encounter takes place between the Union navy (gunship Wissahickon) and Fort McAllister's guns. This time the Union boat is hit, but safely retreats toward Ossabaw Sound. November 19 -- Union ships Wissahickon, Seneca and Dawn open fire on Fort McAllister, an attack that lasts from 8:15 am to 2:30 pm. This time the Wissahickon sustains damage below the water line. As with all gunboat bombardments of the fort, its earthen structure has minimized damage (in contrast to Fort Pulaski), and repairs are quickly made when the gunboats leave. November 22 -- CSS Atlanta is commissioned. She weighs more than a thousand tons and is 204 feet long. She has propulsion but suffers from "poor steerage, a deep draft, and perpetual leakage." In 1863 she will be captured by Union gunboats and enter into the U.S. Navy. Copyright © 2012-2016 Lakeside Press. All rights reserved. Website initially posted February 18, 2012. Last revision June 3, 2016.